There are many places to stay in Caen. It is a lively city and there is a great deal to do. William the Conqueror built much of the city a thousand years ago and many buildings of that period remain today including his castle. There is not enough space on this website to do it justice but a quick online search will soon give you an abundance of info. It is recommended to stay in the centre of the city where there are many good restaurants and hotels - links to a few of the larger hotels are listed below. 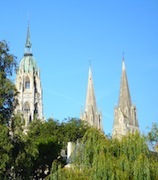 Bayeux was untouched by the war and the centre of the town remains pretty much as it was two hundred years ago. The town houses the UNESCO Bayeux Tapestry depicting William the Conqueror's conquest of England in 1066 and also the impressive Baron Gerard Museum and Notre-Dame Cathedral. 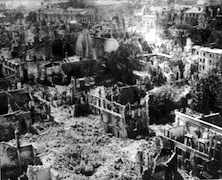 The Battle of Normandy museum and CWGC British Military Cemetery link the town to more recent events. There are many places to stay in and around Bayeux but if you do not have transport make sure you stay close to the centre of town. Links to a few places are listed below. Lion d'Or Hotel - Hotel with a splendid restaurant. Many famous guests! Normandy has a huge variety of accommodation that will suit every taste - camp sites, gites, rustic farmhouses, self catering apartments, stone castles, beautiful manor houses, B&Bs and budget hotels right through to top range hotels with all mod cons. Your first decision requires that you choose the right area to stay in for the tour you are intending to do. Your second decision will be dictated by your means of transportation. 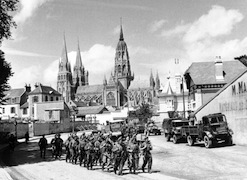 Basically speaking, if you are arriving into Normandy by train you should think about staying in either Caen or Bayeux. Staying outside of either Caen or Bayeux without transportation will mean you have to rely on over-priced taxis or being 'confined to barracks' in your immediate area. 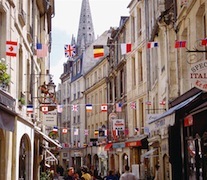 Caen is best for touring the British and Canadian areas. Bayeux is most suitable for the US area. If you are arriving into Normandy by ferry (Caen), particularly without a car, you should either stay in Ouistreham (which is where the Caen ferry docks) or in Caen itself. Pegasus Battlefield Tours can offer 10% discount on all Brittany Ferries crossings to our clients so please let us know whether you require this when making your booking. On the other hand, if you are arriving with your own vehicle then your options are immense. The choice is wide and varied and there are some amazing places to stay in Normandy that will make your stay very special and never to be forgotten. Indeed, we have worked alongside some very good friends for nearly ten years now and we can offer accommodation and touring packages in a 15th century fortified manor house just a few miles behind Omaha Beach and just 6 miles outside Bayeux - more details here. However, there are many more choices and our other recommendations are below. If you have any further questions regarding accommodation and travel please feel free to ask.